Oldest child of Prince Ladislaus and Princess Maria Amparo, daughter of the Queen of Spain; the couple had settled in Paris, France after being losing all their property and being exiled in the 1830 revolution. Both Augustus and his mother contracted tuberculosis; she died when he was six years old, and he was sent to doctors in Switzerland, Italy, Spain and Egypt in a vain search for a cure. Though he was forced to attend court functions and amusements as the son of a prince, the boy had no interest in worldly life, and early felt a call to religious vocation. He studied in Paris and in Krakow, Poland, but school was often interrupted due to his poor health; one of his tutors was Saint Jozef Kalinowski. The turning point in the young man’s life came in May 1883 when he met Saint John Bosco. Don Bosco celebrated Mass in the family chapel of Lambert Palace in Paris, and Augustus served as a 25 year old altar boy. 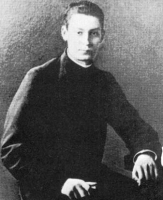 After making all needed arrangements to turn his rights, privileges and inheritance as the first-born to his brothers, Augustus joined the Salesian Congregation in June 1887; Don Bosco was reluctant as he did not think Augustus’s health could withstand the life of a novice and seminarian, but Pope Leo XIII intervened and convinced him. Augustus studied in Turin, Italy, received his cassock on 24 November 1887, and in early 1888 made his Salesian vows at the grave of Don Bosco. After studying in Liguria, Italy, where he became close friends with Venerable Andrea Beltrami, he was ordained a priest at Sanremo, diocese of Ventimiglia, Italy on 2 April 1892 by Blessed Tommaso Reggio. He served as a parish priest in Alassio, Savona, in the diocese of Albenga, Italy for about a year before the tuberculosis did him in. Sixth of seven children of peasant farmers Jean-François Billiart and Marie-Louise-Antoinette Debraine. She was poorly educated, but knew her catechism by heart at age 7, and used to explain it to other children. At age 14 she took a private vow of chastity, and gave her life to serving and teaching the poor. At age 22, she was sitting next to her father when some one shot at him; the shock left her partially crippled for 22 years. During the French Revoluation, a group of her friends helped organize the work she'd started. Julia was miraculously healed of her paralysis on 1 June 1804, and resumed her work. Her organization became the Congregation of the Sisters of Notre Dame (Institute of Notre Dame; Sisters of Notre Dame), dedicated to the Christian education of girls, formally established in Amiens, France, the first vows being made by Saint Julia and two others on 15 October 1804. By the time of her death the Institute had 15 convents. Priest. Joined the Congregation of Hermits of Brettino, which in 1256 merged with the Augustinian Hermits. Chosen the Augustinian Provincial Prior of the Marches of Ancona, Italy in 1269. Chosen the third Augustinian Prior General on Pentecost Sunday 1271, and served till 1274, visiting houses throughout Italy and France, and participating in the Second Council of Lyons in 1274. Unanimously chosen Augustinian Prior General in 1284, and served in that position the rest of his life. 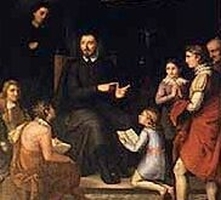 He worked tireless for years with Blessed Augustine of Tarano to revise the constitutions of the Order, implementing them in 1290; they stood for centuries before a new revision was needed. As a leader, he insisted on proper observance of the Augustinian Rule, and worked to found Augustinian houses for women. 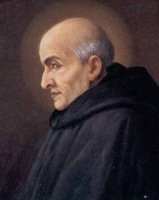 He encouraged his brother friars to become educated, improved the training of Augustinian novices, founded five Augustinian schools, and supported the creation of libraries. He had a deep devotion to the Blessed Virgin Mary, and passed some of that along to the tradition of the Augustinians. Miracle worker. Devoted to the Blessed Virgin Mary at an early age. Trinitarian priest, taking the name Domenico Iturrate of the Most Blessed Sacrament. Tailor's apprentice in youth. Briefly admitted to the Franciscan monastery at Medinaceli, Spain, but was dismissed as not suited for monastic life. Tailor at Santocraz, Spain. Briefly admitted as a lay brother to the Franciscan monastery of Our Lady of Salceda, but dismissed as mentally unstable, and not suited for monastic life. He then lived as a hermit; his reputation for holiness began to grow, and he returned to the monastery of Our Lady of Salceda. Accompanied Franciscan missionaries, ringing a bell in the streets to call people to services. Became a noted preacher in his own right, and known to his brothers for his austerities. He studied under Origen, and eventually became the head of the catechetical school of Alexandria, Egypt. Archbishop of Alexandria. In 250 during the persecutions of Decius, Dionysius tried to flee the city, but was caught and imprisoned. He was rescued by Christians and hid in the Libyan desert until 251. During the Novatian schism, Dionysius supported Pope Cornelius, and helped unify the East. Exiled during the persecution of Valerian in 257 to the desert of Mareotis; he returned to Alexandria when toleration was decreed by Gallienus in 260. Dionysius dealt leniently with the Christians who had lapsed during the persecutions. He wrote a noted commentary on Revelations. Greek Father of the Church. Jewish convert. One of the 72 disciples sent out by Jesus to preach. Had the gift of prophecy, and predicted an empire-wide famine that occurred in 49. Probably the one who predicted Paul's imprisonment in Jerusalem in Acts 21:10. Born to the nobility, the daughter of Lord Armerico of Barbania, and descended from the dukes of Lombardy. Feeling a call to religious life, Libania fled home from an arranged marriage at age 15, seeking shelter at the abbey of San Benigno Futtuaria where she became a Benedictine nun, receiving the habit from Saint William. Her father built the monastery of Saint Thomas for her and some sister Benedictines in Busano, Italy, and Libania served as its first abbess. Member of the imperial Roman court. Third bishop of Como, Italy. Built the Basilica of Sant'Abbondio in Como. First century bishop of Hyrcania, Greece. May have been one of the "70 Disciples of Christ". Martyr. Mentioned by Saint Paul the Apostle in the Epistle to the Romans. First century bishop of Patras, Greece. He may have been one of the "70 Disciples of Jesus". Martyr. Saint Paul the Apostle refers to Herodion as "my brother" or "my kinsman". Mercedarian friar. Bishop of Granada, Spain. Participated in the Council of Florence in 1450. On his way home from that council, he was captured, imprisoned, beaten, tortured and finally executed for his Christianity. Martyr. 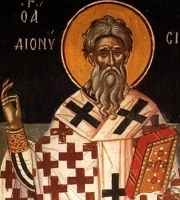 First century bishop of Marathon, Greece. May have been one of the "70 Disciples of Christ". Martyr. Mentioned by Saint Paul the Apostle in the Epistle to the Romans. Second century bishop of Corinth, Greece. Some of his correspondence, including testimony about the martyrdom of Saint Peter and Saint Paul, and correspondence with popes of the era, have survived. Fought the Marcionites and other heresies of his time. Martyr venerated in Carthage, North Africa. A group of African martyrs whose name appears on ancient lists, but about whom nothing is known but their names - Januarius, Macaria and Maxima. A group of Christians martyred together for their faith. We know little more than their names - Diogene, Macario, Massimo and Timothy. A group laymen who were martyred together in the apostolic vicariate of Korea.